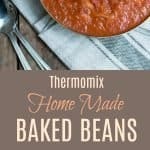 These Thermomix Baked Beans are comfort food at it’s finest. Made with nutritious ingredients which take no time to prepare, you can just set and forget whilst the Thermomix does all the work. The humble baked bean (which is actually stewed and not baked) has been around for over a century. No one made them quite like Heinz and growing up they were a constant staple at the dinner table. Here is a healthier version full of goodness and flavour. The beans in baked beans are traditionally navy beans but if you can’t find any (which I couldn’t find in Coles or Woolies) then cannellini beans work just as well. 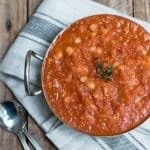 Of course it’s always handy to have a tin of baked beans stashed away in the pantry but if you have a little extra time then these baked beans are worth waiting for. You could always make them in advance and store them in the fridge for later. I absolutely love mine for breakfast served on toast with bacon and eggs, or on top of a jacket potato and melted cheese – so delicious! 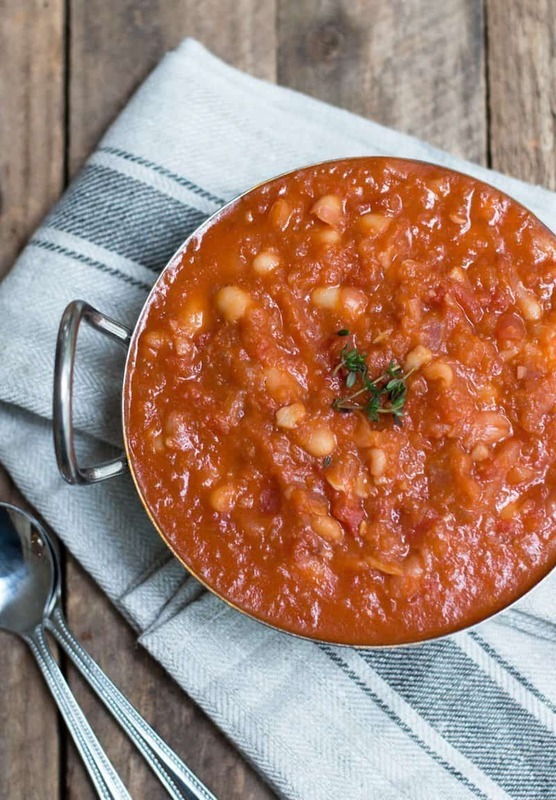 Deliciously comforting and made with nutritious ingredients, these Thermomix Baked Beans are far tastier than the tinned variety. Peel and cut the red onion into quarters, peel the garlic and add to the TM bowl and chop for 4-5 sec/speed 5. Scrape down the bowl, add the olive oil and saute for 3 mins/Varoma/speed 1 until translucent. Add all the remaining ingredients and cook for 10 mins/100/reverse soft speed using the basket instead of the measuring cup. Season with salt and pepper and serve on toast or as a side dish. These Thermomix Baked Beans can be stored in the fridge for a few days in an airtight container.